I can’t believe I am already working on Valentines! 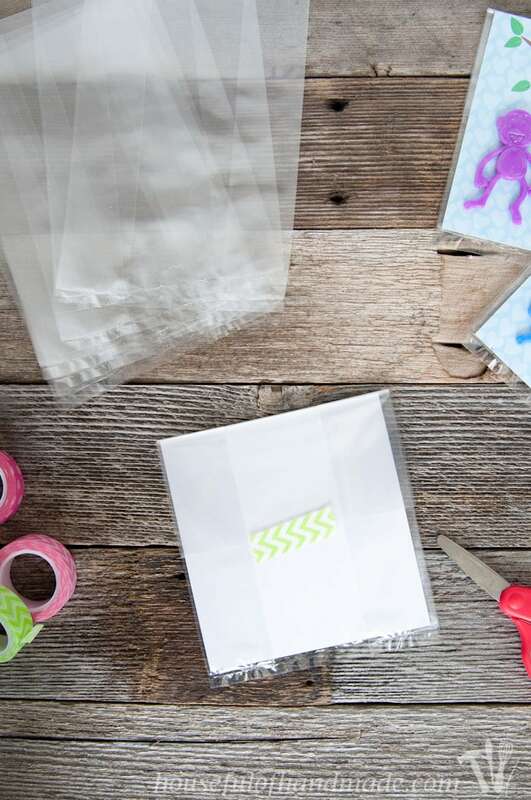 I am usually staying up late to hurry and finish all my kid’s Valentines the night before they need to take them to class. Sad, I know, but I work really well under pressure. That is why I put Valentines on my January blog calendar this year. Now I was committed to getting them on the blog so I actually got them done in January! I’m patting myself on the back right now. 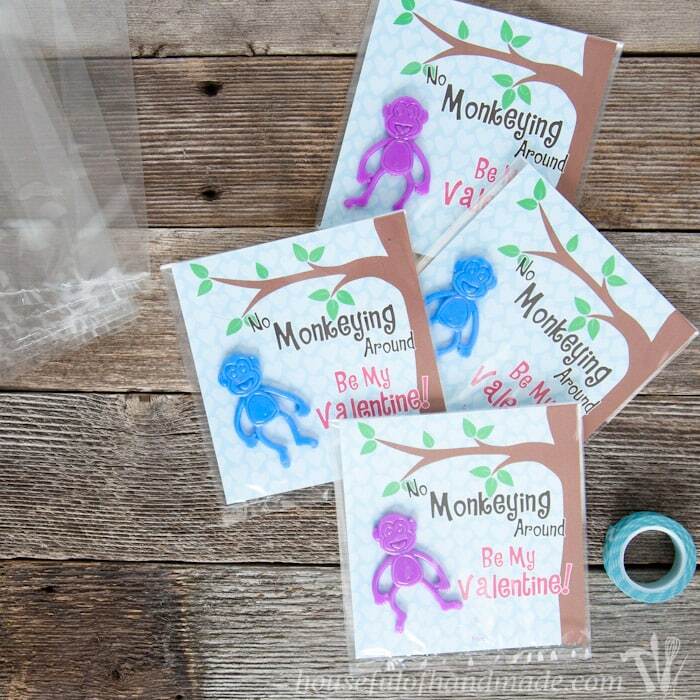 Luckily you don’t have to see it, so let’s get on to these adorable Free Printable Monkey Valentines. I prefer doing non-candy Valentines for my kids. We get plenty of candy, and usually never eat it. I still have a small bucket of candy left over from Halloween. I put it up high in the pantry and let the kids earn it, but honestly, we all tend to forget about it and I’d rather make caramel popcorn or cookies when we want a treat (speaking of popcorn, I have a special treat for you in February, 14 days of popcorn recipes, you don’t want to miss it!). As I was enjoying my 2 hours of kid-free time I get each week when my daughter is in preschool and I don’t have other engagements, I spent about an hour of it wandering the Dollar Spot at Target. I just love that place! I ended up spending over $20 on just Dollar Spot items that trip. Luckily I found these adorable stretchy monkeys. They come 6 in a packet for $1. Big score! 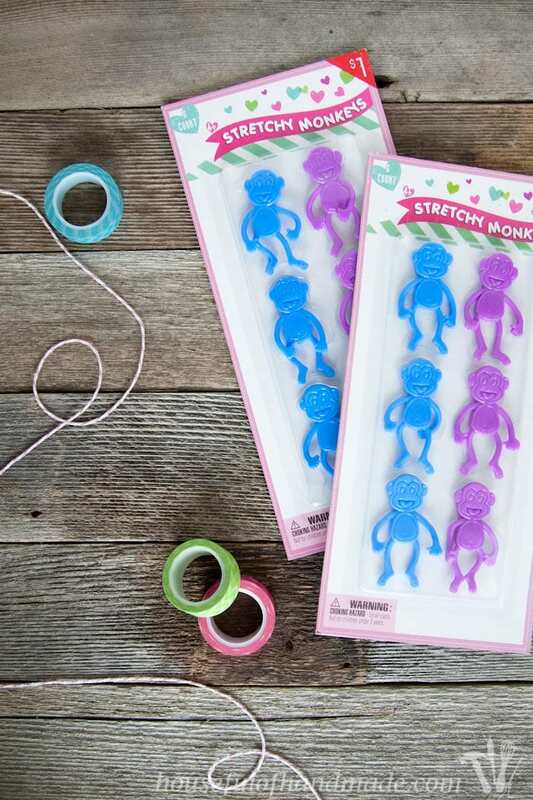 I knew my kids would love playing with the sticky, stretchy monkeys (and I was right). So I knew they would make the perfect Valentines. To make these fun Valentines, I made up a free printable. I love any reason to practice my Illustrator skills (I designed two birthday invites for sisters this week too). 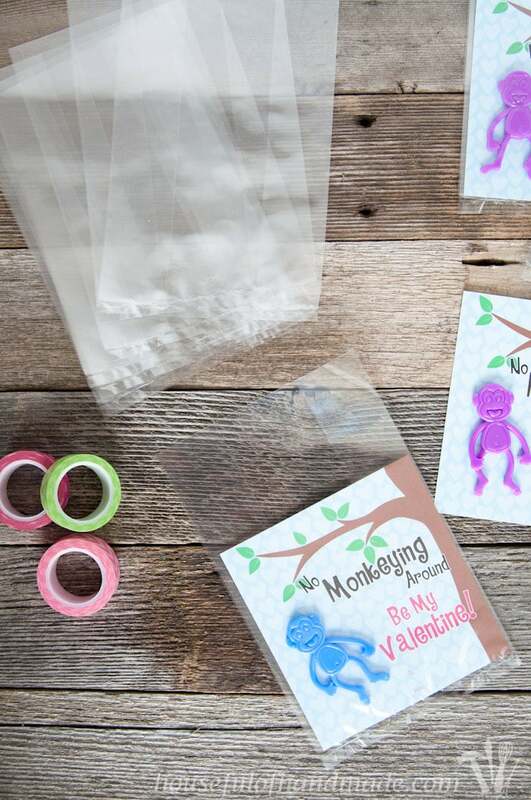 I knew I wanted to put the stretch monkeys in a bag so they wouldn’t collect all the disgusting stuff in the bottom of the kids backpacks. Yuck! So I made the printable to fit into a standard treat bag. I bought these bags that were 5″ x 10″ but only needed then 7-8″ long so I quickly trimmed off the 2 extra inches off the top (keeping the seal at the bottom intact). To attach the monkeys I was planning on tying them on with some butcher’s twine, but I discovered it was unnecessary. 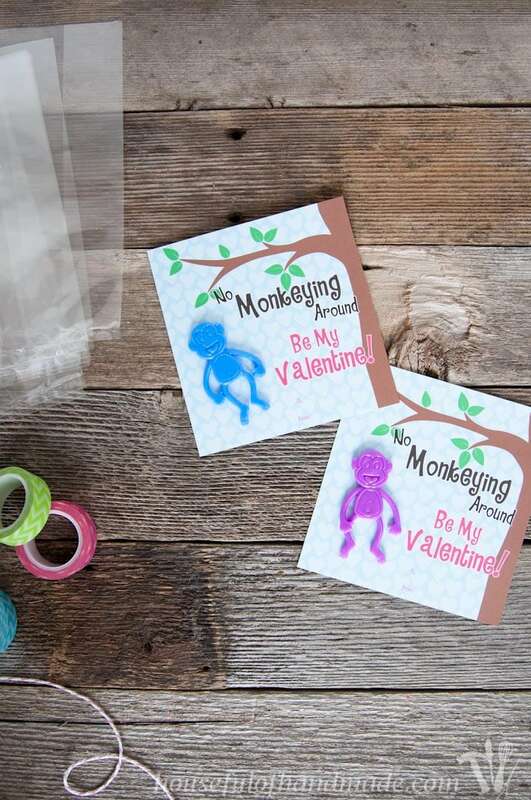 The monkeys were sticky enough to stay put on the Valentines all by themselves. Score for 1 less step. Then I slid the Valentines into the bags. Be aware that the sticky little monkeys will try to stick to the bags. I tried to keep the bag off the monkey while I slid it in, then when the bag was in place, I let them stick together! 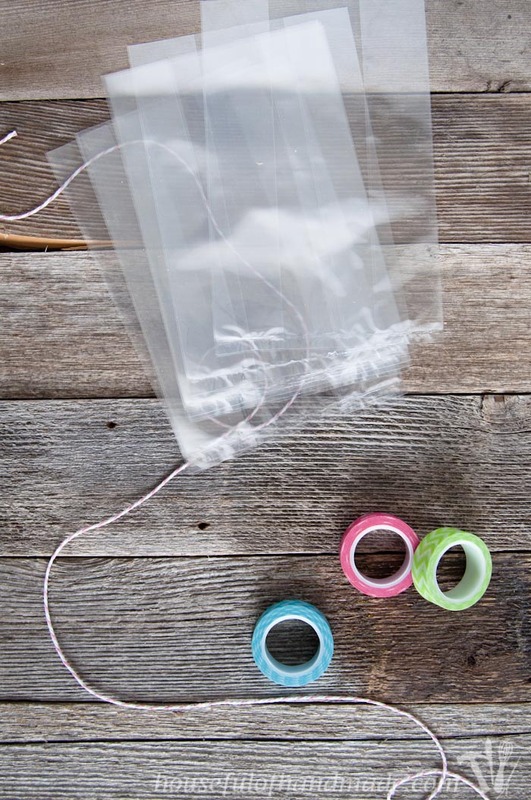 To seal up the bags, I folded the bag over the back and secured it with a strip of washi tape. I’ll take any excuse to use some washi tape. I just love how they turned out and they were so easy to make! 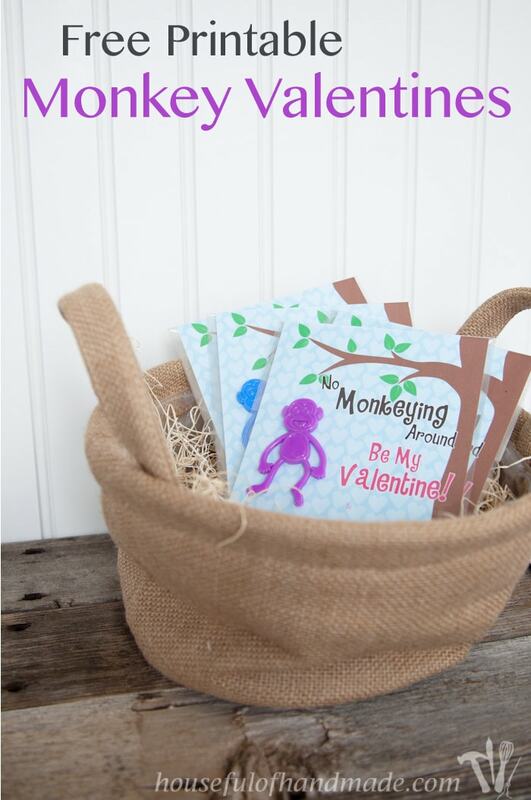 I really hope all the kids love their stretchy monkeys. My kids have been playing with the extra ones a lot. 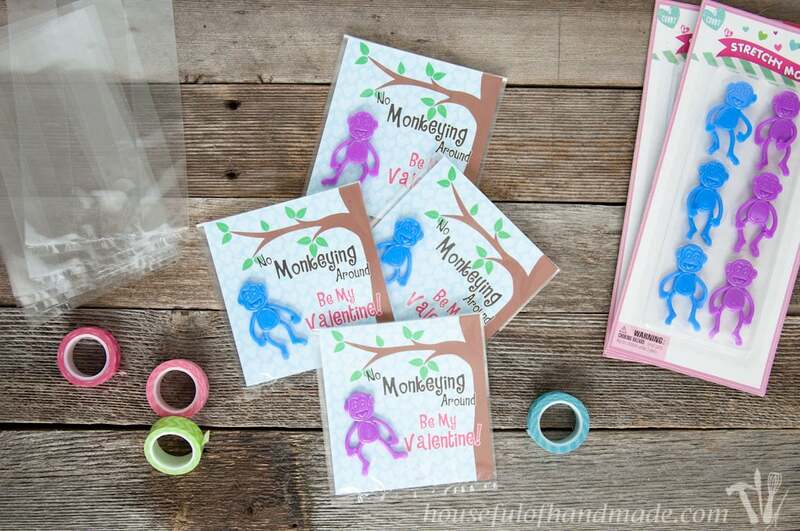 If you want to make your own stretchy monkey (or any little toy monkey for that matter) Valentines, download the free printable below! Yeah, now I can cross one more thing off my to do list. And after I get my son’s Valentines finished we will be weeks ahead of last year! I love your Valentine’s Day cards. This one and the pencil one are such a great alternative to all the candy! So cute and creative! Thank you Celeste! Non-candy valentines are great. Thank you for sharing Emily! 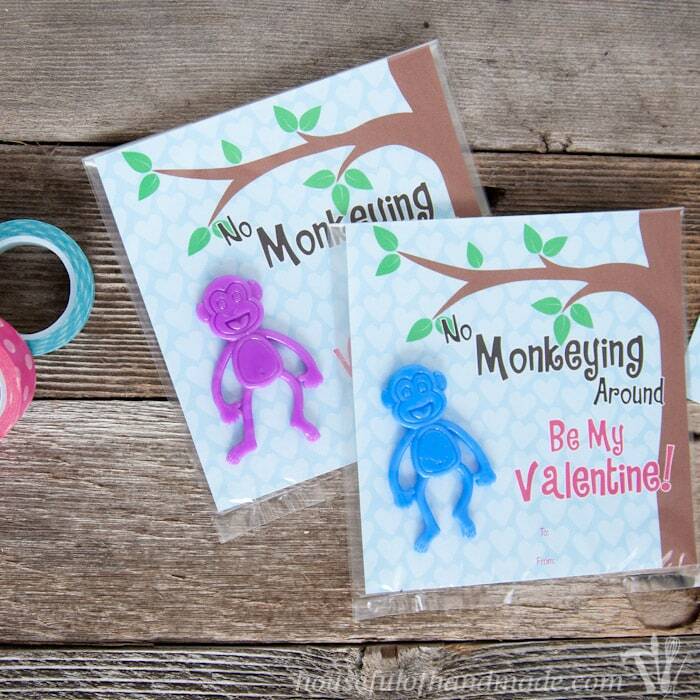 I love non-candy valentines so much and my kids do too! I like non-candy valentines also. Thanks for such a cute idea.